So you are wondering if Nutrex spirulina powder is worth the money? Is it a good quality spirulina? To answer this the main thing we need to look at is what Nutrex Hawaii does to ensure that their product is top quality. As you can see this product is made in the USA! Thats a huge plus. The United States has some of the strictest food regulations around. Now if it were coming from China thats another story. This spirulina is grown on Kona Coast which is located on the big island of Hawaii. This area is a biosecure zone and is certified free of pesticides, herbicides, and industrial pollutants. Nutrex Hawaii’s spirulina is regulated by 4 different agencies! Straight from Nutrex Hawaii’s website you can find this information. The spirulina they sell is regulated for quality by the FDA, the State of Hawaii Department of Health, the US Department of Agriculture, and the Federal Trade Commission. Beyond this, it is GMP certified, which means it meets quality standards throughout production. To be regulated this intensely, the chances for a good quality product is high. Every part of the production process is inspected for safety and compliance with laws, including manufacturing, packaging, and labeling. Quality assurance is a must when it comes to selling products and Nutrex Hawaii makes sure to put a lot of emphasis on this. You already know that you can trust that their spirulina is safe, with all the regulation and inspection. So what else is good? Well, Nutrex Hawaii’s spirulina is herbicide-free, pesticide-free, gluten-free, lactose-free, vegan, and is non-GMO project certified. And the spirulina is grown in deep sea water. Nutrex Hawaii’s facility pumps ocean water from 2,000 feet down just for the spirulina to grow in. And this is actually more important than you might know. The deep sea water they pump in is more rich in minerals and has all 94 trace elements. Its no secret that spirulina is one of the most fowl tasting foods there is, and this is no exception. I’m sorry to say that NO Nutrex Hawaii’s spirulina powder isn’t the delicious spirulina we have all been waiting for. But thats just the way spirulina is. If you want raw, natural spirulina at its finest, then its going to taste bad. I will say that this spirulina “might” not taste as bad as others though. Its hard to judge because I mix my spirulina powders in smoothies, but I do think this spirulina is a little easier on the tastebuds than others. I’m not sure why but the nutrition label on the bottles say that you can get 150% of your RDA of vitamin B12 with one teaspoon of spirulina. This is NOT true. Spirulina contains a lot of vitamin B12, true. But the majority of it (around 85%) is UNUSABLE by the body due to the type of vitamin B12 it is. There is absolutely no way that one teaspoon of spirulina provides 150% of the RDA. Unless of course vitamin B12 is added, which in this case it is NOT. There are a lot of spirulina producers out there that market spirulina boasting of its vitamin B12 content. Its simply not true. Since Nutrex Hawaii’s production is regulated by the FDA, I was at first confused as to how they could get away with improper labeling. So I looked into it and found that the actual label and ingredients in their products aren’t evaluated by the FDA. I have already written an article on this B12 controversy if you want to learn more. Even though they are misleading people with the vitamin B12 information (which many companies are), Nutrex Hawaii still produces some of the highest quality, if not THE highest quality, spirulina thats on the market. You can buy their spirulina without worrying if it contains harmful bacteria, pollution, etc. It is truly great. If you have tried a lot of different spirulina powders you will notice that this powder is richer in its dark-green”ness” than some others. It literally looks like its better quality than a lot of powders grown in other places. And I guess we can attribute this to the almost perfect growing conditions that Nutrex Hawaii provides. 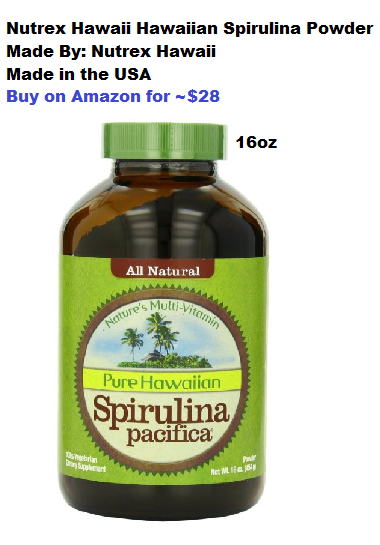 The price of Nutrex Hawaii’s spirulina powder (16oz) is cheapest on Amazon.com for right around $28. And thats really not too bad if you think about it. Lets say you take a tablespoon per day (7g), which is normal. If you continue with this it will last you about 64 days. If you decide to take the serving size that is suggested on the label, which is only a teaspoon (3g), then it will last you about 151 days! For me, 3 grams a day just isn’t enough. I would up the serving size that they suggest if I were you. Then read from 100’s of customer reviews and then decide. If you have a review of your own please leave it below to help educate others on this product. Also if you have any comments or questions leave them below as well.